This month there are Transition Gardens in production and construction all over East Anglia. 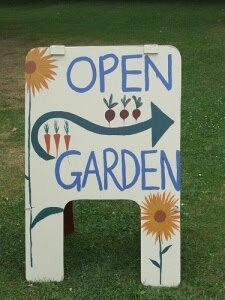 Produce is being swapped and shared, not just from garden shares and allotments, but from Transition plots in all sorts of extraordinary places. Here's our round up of some of the East's flourishing community gardens. 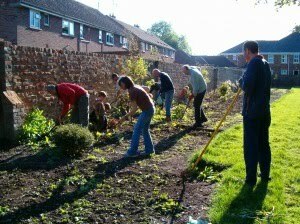 Transition King’s Lynn began their Edible Garden in the Walks (public park) in May 2009. They have been running regular workdays, planting and sowing days, picnics and tree pruning workshops ever since. As part of Love Parks week last August Transition King’s Lynn staged an event that involved planting up lots more plants, including lavender donated by the Borough Council, and more vegetable and herb plants. Visitors to the bed were treated to a share in the harvest of salad leaves and French beans, and children were able to sow seeds of rocket, radish and oriental leaves in biodegradable origami pots to take away and plant at home. Here's Viv from KL: "Some members of Transition King's Lynn set up a stall in the Walks to give away some of the produce from the bed. The feedback from this was very positive, though some people were suspicious as to why we were giving it away for free, and others simply couldn’t bring themselves to take it for free, so gave donations (gratefully received!). Other surplus produce has been donated to a local homeless charity to be used by the cooks in their day centres." The produce from the bed is available for anyone to harvest and eat themselves. TKL is always open for more people to get involved -seeding, mulching, weeding, watering, dead-heading, harvesting etc. So do get in touch if you'd like to join in. Transition Wivenhoe began their Station Garden this Spring and the Food Group has gained Network Rail's approval of the Station Master's House community food garden. Travellers, station staff, passers-by and garden volunteers have enjoyed crops of rocket and lettuce. Courgettes, peas, tomatoes, potatoes and winter squash are on the way. Volunteers have helped regularly at Broomgrove School veg patch, it has been lovely to suppport the children's enthusiasm for growing food. This Friday they had a Station Garden cookout. Here's Peta of TW's very active Food Group: "The overwhelming verdict of the station house garden marrow curry, cooked up by Kaushali yesterday was "delicious!". This has been a much watched and commented on vegetable over the weeks as walkers, cyclists, commuters, garden helpers and station staff have witnessed the little courgette turn into a fine marrow. Even Wendy the station cat seemed to have an opinion, though perhaps a slightly dim one as she has had to shift her sun bathing spot as the monster plants have slowly taken over her space. Watch out as the winter squash are next to surprise and delight... along with the fantastic sunflowers of course. Over 40 bowls of veggie curry and handmade rolls were dished up to surprised passers by, a few commuters who made the time to stop and some Station Pub regulars, along with food group activists who set up the stall outside the entrance to platform 1. In Bungay this summer we've been engaged in laying the foundation work of our Library Courtyard Garden (you can follow our Community Garden blog, brick by recycled brick!). Yesterday we shovelled 5 tons of top-soil into the beds ready for planting up our fruit trees (cherry and apple and pear) in our permanent bed and seasonal flowers, vegetables and herbs in our seasonal round bed. We’ve also got a wormery, rainbutts and compost bin, so our “Living Library”, as well as providing an outdoor meeting place and a quiet spot in turbulent times, will serve as a showcase for the ecological principles behind Transition. Designed by a working party formed after our Permaculture course (taught by Graham Burnett of Southend-in-Transition) in January it will be a living demonstration of everything from carbon reduction to water conservation, medicine plants to the restoration of the honeybee. We’re hoping to have a grand opening for everyone who has been so far involved in the project (about 100 people) in September. 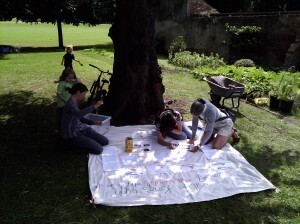 Transitioners hard at work in King's Lynn Edible Garden; making banners under a Walks tree; planting the first potato at Wivenhoe's Station Garden; rocket to go; Sustainable Bungay workparty at the Library Courtyard.